Who has the highest mileage Tiger? Re: Who has the highest mileage Tiger? This is my second Tiger 800. I bought them both from new and part exchanged my first Tiger XRx with 24000 miles on the clock after just under 2 years. I should add that this bike was in for damage repairs for about 6 weeks of the first year after a car driver took me out and damaged my bike quite extensively. I have had my current XRt now just on a year and I've clocked over 11000 miles. By the end of my second year on this bike with my scheduled touring plans will again take me to the 24000 mile marker, if not more. 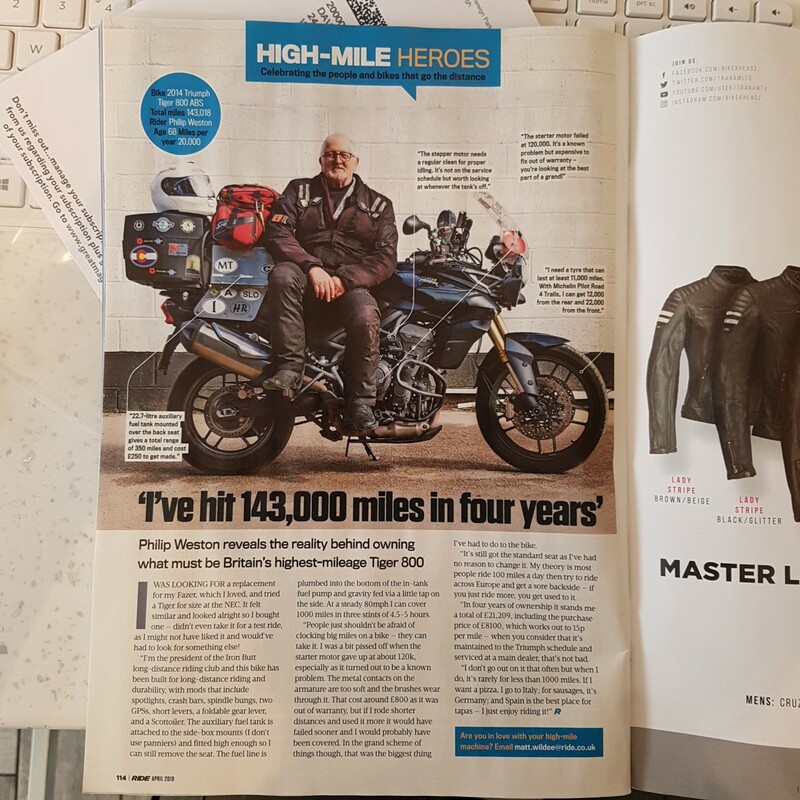 So, on average, I am regularly doing 12000 miles pa. Apart from the period when my first bike was out of action I have not had any complaints or problems with either. We haven't heard from (Fazer)Phil for a while on here, but almost 12 months ago his 2013 Tiger had 120,000 MILES on it. that has got to be the highest !! I think triumph should give him a free new bike at 200,000 and strip his down to see how it has fared. Damn, I'm only around 72000km on my 2012 now. But didn't get to ride much last summer and the 45cm of snow on the ground here has it in the garage. It would be a nice gesture from Triumph, but somehow I don't see it happening...more likely a 5% discount on a new bike...if they're in a very generous mood. It happened once, for Andy Utting after 260k miles. It was all the talk of the club back then. Triumph stripped it & checked every component to find them all within spec, or so the story goes.